Update, 29 May 2018: this story has been updated with release times for the Hungering Deep. Sea of Thieves’ next update is called The Hungering Deep, and it’s due to land today. The Hungering Deep update will be entirely free, and add a slew of permanent new features to Rare’s pirate sim. These include drums, flags, speaking trumpets, and tattoos, and will be introduced by “a special time-limited campaign.” Presumably, said campaign will expire when it is superseded by the next update, if not before. The campaign sees you follow a trail of riddles and rumours to discover what became of ‘Merry’ Merrick, the almost comically cockney pirate who appears in the trailer (see below), and the proud owner of not one but two peg legs. For more collaborative multiplayer fun, check out the best co-op games on PC. In said trailer, Merry regales the viewer with stories of the sea from a campfire (a tried and true venue for regaling). He tells of ships disappearing without a trace, and sightings of something “impossible” – according to the devs’ content roadmap, Hungering Deep will “bring with it a new AI threat to the world”, which you will have to work together to discover and defeat in a unique event. Merry tells us further of ancient people who learned to fear and respect the denizens of the deep, and even to “summon” them by performing sacrifices. Animated cave paintings indicate that one of those creatures is a giant shark, perhaps a megalodon. 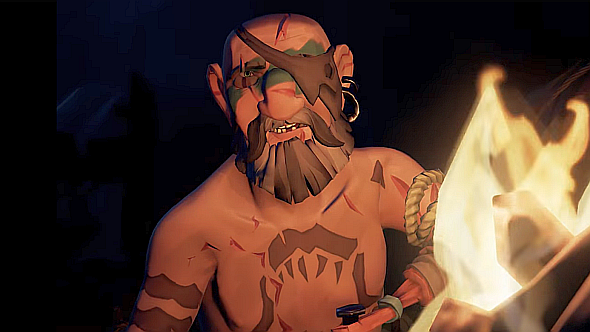 If you want to believe Sea of Thieves players are about to get the ability to summon megalodons and sic them on rival crews, who are we to take that away from you? Head over to Rare for more details on these new features, quests, and threats. Here are the devs confirming the 14:00 BST unlock time on Twitter. For more on Rare’s future plans for Sea of Thieves,here’s another blog. In summary: two more content plans are scheduled for further into the summer, one of which will add a new ship type, and the other an expansion to the world map.